Over the last few weeks I have got several games of SAGA in with Adam, and I must say that I have enjoyed playing the game again. I believe it probably has been a couple of years since I have played. 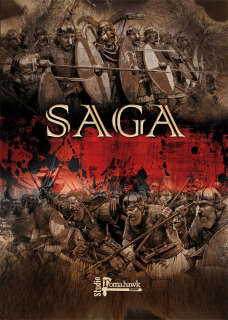 The game is certainly nuanced and although probably a poor simulation (my preferred style of gaming) of Dark Ages warfare, it is a lot of fun. Adam has been playing Vikings and most recently Norse-Gaels, while I have been playing Anglo-Danes but Vikings in our last encounter. The Battleboards certainly make the game a lot of fun. Here are some links to AR's of our recent games. Adam has beaten me in every game but I managed a tie in our last game. The great thing about the ruleset is that with the same group of figures one can play several different factions. Each faction however is quite different. It has been a lot of fun. I can recommend the game. Yes that is one of the very attractive things about the game. I haven't tried these rules John but your battle reports make it look tempting. It is a lot of fun Pat, I can recommend it. I've just gotten into Saga and have enjoyed it too! Thanks for the great battle reports. Thank Adam for the reports. Beautiful looking game, love the terrain on the first one...and figures on each of them!